(Above) Troy Herfoss (1) at speed. Photo by Andrew Gosling/TBG Sport, courtesy of Motorcycling Australia. 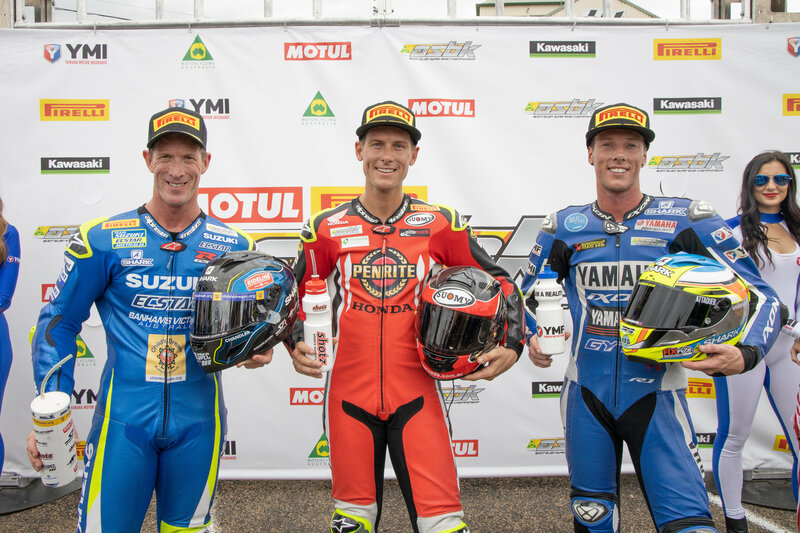 Troy Herfoss (Penrite Honda Racing, Honda CBR RR SP) took win number two of two in Kawasaki Superbike in front of a massive crowd here at Round 2 of the 2019 Motul Pirelli Australian Superbike Championship (ASBK, March 22-24). Herfoss’s home fans turned out in force to watch the Goulburn local claim the round win, with over six thousand coming through the gate across the weekend to set a record crowd figure for the ASBK at Wakefield Park. Cru Halliday (Yamaha Racing Team, Yamaha YZF-R1M) claimed second for the round on 41 points, and Wayne Maxwell (Team Suzuki ECSTAR, Suzuki GSX-R EL R) was third for the weekend on 35. The result sees Halliday now provisionally leading the championship on 96 points, ahead of Herfoss (91) and Mike Jones (83, Desmosport Ducati, Ducati 1299 Final Ed) who had a fantastic performance to claim fourth for the round as an injury replacement for Troy Bayliss. (Above) The start of Australian Superbike Race Two at Wakefield Park. Photo by Andrew Gosling/TBG Sport, courtesy of Motorcycling Australia. Herfoss still held the lead at the front as the race passed its halfway point, with Halliday in second and Jones third after squeezing the Panigale up the inside of Maxwell's Suzuki at turn 11. The front two had built up a gap from the leaders and were looking to make a two-way battle to the finish when the race was red-flagged after thirteen laps. Kawasaki’s Lachlan Epis (Kawasaki BCperformance, Kawasaki ZX10RR) had crashed and required medical attention, handing the win to Herfoss. (Above) Race Two winner Troy Herfoss (center), runner-up Cru Halliday (right) and third-place finisher Wayne Maxwell (left). Photo by Andrew Gosling/TBG Sport, courtesy of Motorcycling Australia. Round 3 of the Motul Pirelli Australian Superbike Championship heads to The Bend Motorsport Park, SA, 26-28 April. To keep up to date with all the news from the ASBK, head to ASBK.com.au. 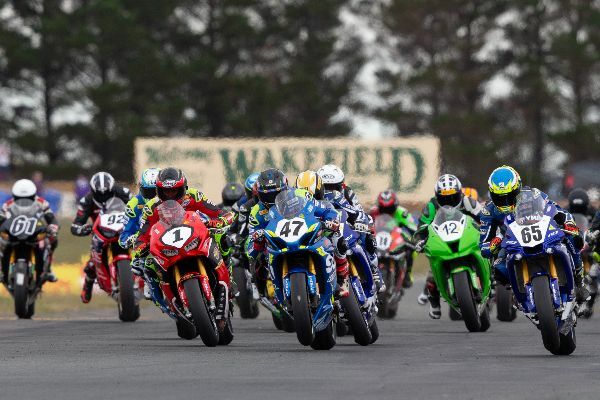 Follow all the ASBK action from Wakefield Park on Facebook and Instagram.